OIRM supports cell therapy clinical trials in Ontario through funding for its large Disease Teams program. 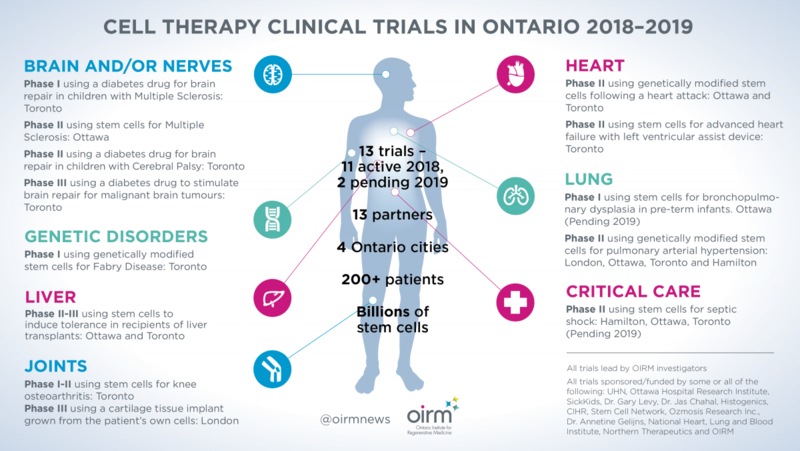 Currently, OIRM is directly supporting one clinical trial (septic shock) and several other research projects where clinical trials may launch in 1-4 years. Through programs and workshops led by OIRM’s Clinical Translation Initiative, we help build capacity and expertise for new clinical trials to find success in the future. If you are a patient or caregiver seeking information about clinical trials, we recommend you review our About Clinical Trials page. For more information about current and upcoming clinical trials in Ontario, see the list below. This trial listing is also available in the graphic format for download and sharing. Click the icon below.